Briefly, the bird was watched as it sat on the sea off Brownstown Head with Manxies for a full half-hour 8.30-9 pm on Saturday night, 14 August 2010 - first noticed by Mary Duggan (MAD). This was a shearwater with a strikingly and consistently grey head/neck (with dark 'mask'), but otherwise essentially Manx-like apart from slightly paler/less black upperwings etc. Not exactly the 'classic' albeit difficult in-flight Yelkouan features generally highlighted in the literature or online, but (to my eyes) consistent with or inferable from ID material or photos covering birds in flight or at colonies. I texted Waterford-based birders late that night, after checking some online & print references, suggesting it was a "Good(?) candidate for Yelkouan Shearwater". Further checking of print & online references since has convinced me even more. Checks the following day were unsuccessful, though the main flocks may well have stayed overnight. I was unable to check until midday - ringing commitments - but glare was too strong though 650ish feeding Manx still present. An early evening seawatch produced 5000 Manx & 5 Balearics west in a hour from 5:30 pm in better light but there no close feeding flocks at that stage, though some doubled back and may have settled further east later. Yelkouan Shearwater currently seems to be considered a near-impossible species/taxon to confirm outside the Mediterranean, although there have been quite a few claims (some of well-seen birds) from SW England during 2008-2010. A bird seen off Devon, 29 July 2008 has reportedly been accepted by the British Birds Rarities Committee but is currently being considered by the British Ornithologists' Union Records Committee before possible admission of the species to the British list. The situation is confused by the so-called 'Menorcan' Shearwater (whose taxonomy is controversial despite earlier conclusions that they were 'extreme pale' Balearics, then Yelkouans breeding sympatrically with Balearics, then hybrids, currently ???). Pending further conclusions re 'Menorcan' Shearwater, I've used the term "Yelkouan-type shearwater" here. An initial summary is given below, followed by more detailed notes. MAD & I arrived late at Brownstown on Saturday 14th. A brief seawatch at Helvick Head on the way had produced a Balearic Shearwater feeding close inshore (5-5:20 pm) so I was keen to check the sea at Brownstown too. But we didn't get to the cliffs until until 8:20 pm, and it was clear that Manxies were just milling about, back and forth between feeding flocks, so we checked through the flocks for Balearics rather than logging non-passage. Of 500+ Manx, 300+ were close enough to shore to be checked in detail, on an almost flat sea in reasonable light (mainly clear sky but western horizon obscured by cloud so sunlight wasn't direct and Manxies SE or directly S were still fairly 'black-&-white'). Something about underwing on one flapping bird in the closest flock suggested to MAD that one bird might be interesting. It was, but not in expected way - a shearwater with an obvious mid-to-pale GREY nape / rear crown / hindneck (or upper hindneck) contrasting with but probably fading into an apparent dark 'mask' through eye, otherwise looking pretty similar to the "other" Manx. We're talking actual grey (not 'warm' or 'brownish' in any way, at least not in this light) - i.e. grey as in some photos or illustrations of winter Black-throated Diver, or, pushing it, Lesser Whitethroat (impression also helped by the 'mask'!). Given the paleness of the underparts (including vent looking as pure & extensive white as on Manx, from side and in rear views) I suggested Yelkouan Shearwater (half-facetiously no doubt). The bird continued to sit on the sea, without feeding, for the half-hour, while we watched it continuously through 30x & 15-45x scopes. By the time I saw it, it was in a discrete flock of 6 Manx (having drifted west from or been left behind by a larger flock). The 'grey-headed' bird was unerringly detectable almost regardless of what angle the birds faced, though they mainly faced west (into obscured sun) or south - but no head-on views - while none of the others ever showed anything but a clean B&W head pattern (sometimes with white behind ear-coverts sometimes not). The 'mask' impression appeared to be through eye from bill base or perhaps forehead, but extent difficult to define and no clear details seen of forehead or fore-crown. I noted "upperbody/upperwings on water not hugely different from Manx, but slightly paler / less intense dark". Fairly soon, I began to consider Fea's Petrel or similar in terms of the greyness & apparent pattern of the head/neck, though the fine shearwater-bill clearly contradicted this. Head shape/size was clearly Manx-like too though head gave impression (at least at times) of being slightly bigger than on Manx - maybe an artefact of different patterns. I foolishly took my eye off the bird briefly just after 9 pm, and MAD saw it fly - I got onto it almost immediately as it flew a short distance west then turned south to a larger, active feeding flock offshore. (I'd previously hoped the flock of 7 was settled to roost for the night, as they were just resting or bathing throughout.) Unfortunately my flight view was too poor & brief to be conclusive of much: it's flight was 'flappy' enough for Balearic though Manx were also quite flappy tonight in the calm conditions; no real heavy bodied/pot-bellied appearance like typical Balearic; I noted "perhaps shorter-winged than Manx"; "apparently feet trailed slightly but not 100% certain" [immediately after take-off so might not have been relevant anyway]; pure white underbody; no clear or long-enough view of underwings (my earlier views of flapping bird also inconclusive); head-pattern/shade not obvious. Distance offshore? - I don't trust my estimates enough to judge this, but certainly >500 m - far enough that bins probably wouldn't have detected the bird, but close enough through 30x scope to discern bill shape/size including individual mandibles. (Twice, the bird 'yawned' or gaped - holding mandibles wide apart for perhaps a second? - not obviously in aggression.) No details of eye or eyering-area visible. Why not Balearic? The pure white underparts, including vent, and no more than Manx shape / size, appear to rule out even pale extremes of Balearic, unless the so-called pale 'Menorcan' Shearwaters which have previously been considered (or miscaptioned?) "extreme pale Balearics". Manx? The only strikingly "different" feature of this bird was the contrastingly paler, grey nape / rear crown / hindneck; differences in rest of upperparts were less marked though still noted. I'm aware that there must be a possibility that an aberrant Manx, or one in a particular state of plumage wear, fading (or freshness? ), might show similar features. Or perhaps one in head moult if patchy white feather bases among black feathers produced a near-enough 'grey' appearance. But no indications of such patchiness from what I could see. Plus I've never noticed such a bird on the sea or in flight (excluding birds disappearing into glare of sun when most Manx can look a bit Yelkouan) - or heard of one (though I must track down some of the fairly extensive literature on albinism & leucism in shearwaters). Transcript of field notes written immediately after observations ended [clarifications added while transcribing are square-bracketed]: "14/8/10. Brownstown Head. Vis ex. Virtually flat calm. 1/8-2/8 but cloudy towards west, so rarely full sun on birds. Manx 300+ on sea or circling. 500+ overall [update]. 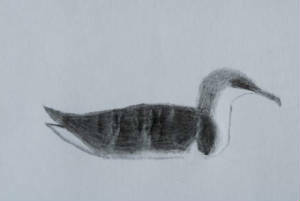 Manx Shearwater-type bird 2030, found by MAD in flock of 7 birds. Obvious quite pale-looking grey nape / rear crown contrasting with dark 'mask' from base of bill up through eye (possibly involving forehead & forecrown but not certain). This very obvious when bird facing W or S, and also when facing east. Almost like an auk going into winter plumage. As obvious as on some Bt Divers in winter / spring plumage, Lesser Whitethroat (or Fea’s type petrel). Size & structure seemed similar to Manx, but head gave impression of being bigger (perhaps illusion due to pale grey of most of it). Bill quite long & obvious, apparently more obvious than on Manx, but quite thin. Seen twice flapping – once by MAD, once by PMW: on my view, certainly pale white overall but with duskier/pale grey near primary tips? [Not sure quite what I mean there.] MAD had impression of narrow white below [wing] with possible dark line up through. Odd-looking pale / whitish / off-white projection upwards at ‘shoulder’ on water. [At least on right side.] Vent / undertail coverts pure white, as obvious in paleness & extent as on Manx. 2100, got up & flew out to large feeding flock of Manx (it had been sitting quietly for last half hour [apart from occasional bathing]) – appearance of Manx, flight appeared close to ‘Balearic’ flapping but not certain. Apparently feet trailing slightly beyond tail but not 100% certain. Pure white underbody in flight. Perhaps shorter-winged than Manx. On water, structurally looked very similar to Manx but possibly less streamlined – tail & wingtips seemed to coincide, though wings usually held [less] obviously horizontal (30-45 degrees) to a greater extent than 5 of the 6 Manx it was with. Upperbody / upperwings on water not hugely different from Manx but slightly paler / less intense dark. Pure white chin / throat, belly, breast, vent based on views on water plus in flight. [This excludes dusky areas on breast sides / upper flanks shared with Manx.] 500+ m range. Gaped – opened bill wide twice, though not obviously in aggression." Notes added next day (15/08/2010): "Bill held at 45 degree angle down; in line with bill, across lores and through (plus slightly below??) eye, ill-defined dark patch up ‘face’ [i.e. following the 45-degree slope "up"], perhaps to slightly behind eye. Demarcation between [grey of] ‘cheek’ and white of throat poorer than between lores area & white chin. Not clear if grey of nape / (upper) hindneck extend onto middle / front of crown or upper forehead. Likewise not clear to what extent or how rapidly the grey ‘faded’ into darker blackish of mantle (lower hindneck colour not certain) [though MAD felt lower part of hindneck was also grey]. Not giving impression of being ‘patchy’ i.e. not just (obvious) white speckling on blacker background, but probably some ‘indentation’ of white into the grey behind or on rear ear-coverts, or grey paler again (not clear which, or precise shape). Mantle / upperwings gave ‘impression’ of being less uniform / cleanly black than Manx. At no time, at this range, was a pale eyering visible. In side profile, similar area of white visible below as Manx, though precise shape different at front / ‘shoulder’, at least on right wing (the main side seen – when bird faced left, side pattern was less clear or less visible). Range was 500+ m, perhaps closer to 1 km, but sufficiently close that through 30x scope, length & slimness of bill (and of each mandible when it twice ‘yawned’ / gaped) could be seen – a long, slim, blunt-tipped bill, appearing somehow more ‘obvious’ than on Manx. Impression of grey of nape / hindneck was 100% consistent. Head could appear larger / rounder than on Manx but may well have been an illusion resulting from the much more contrasting b&w appearance of Manx. In rear view, uptilted tail with obvious, extensive white, as on Manx in direct comparison. Some direct comparison with 3 summer / moulting Razorbills & 1 Guillemot, but no definitive comments on ‘shade’ of upperparts. At times, appearance of head from side had something in common with a 1st-winter Raz or adult in moult, i.e. extensive area of pale behind eyes, but actually [sentence not completed]. No clear differences in posture on water [between the shearwaters] – equally ‘high’ on water as Manx, though wingtip & tailtip more ‘separate’ (perhaps wings more uptilted) than on 5 out of 6 Manx when [specifically] checking on one occasion – temporary posture variation? No specific observations on shape / pattern of rear flanks / presence / absence / shape of dark patch / boundary between belly & undertail coverts, except that no obvious difference drew attention to itself. Towards the end, before it flew, it was bathing, then some of Manx did so. Direct sun shone on it only once – white went ‘golden’ (MAD) but no major effect on upperparts (bird facing sun) [I don’t remember seeing this myself – perhaps I was concentrating on upperparts]. MAD: straighter boundary between ear coverts / side of upperneck and that on Manx, though also grey (not black) [on Yelkouan]. MAD first noticed the bird when it drew attention by showing apparently darker underwings than Manx earlier that day [at Brownstown & Helvick], with impression of a diffuse dark line or stripe through the underwing. Then she checked [further] in case it was a Balearic (we were actually searching through c500 Manx for a Balearic)." Points not covered above, notes added online 17/08/2010: I think the upper mandible was, just-about, seen to be hook-tipped, but I either forgot to note this down or was not certain enough that I wasn’t inferring it. I did forget to note down anything on bill colour but it was not strikingly pale, in general looking mid-to-dark grey in the light conditions prevailing; certainly, not noticed to be different from accompanying Manx. Apart from comments on the ‘shoulder’ area, and vent viewed from rear, I didn’t describe the appearance of the underparts in side-profile on the water. But, with the exception of the ‘shoulder’ comment, which maybe just reflected individual variation, the pattern was similar to or within the range of the accompanying Manx. In hindsight, I’d like to have paid more attention to the vent in side-view, to determine any detailed differences in extent of white, but nothing stood out as obvious. Likewise, I didn’t specifically assess whether the dark/dusky area at breast-sides on water differed in shade, or in amount of contrast with upperwings, between the Manx and the other bird. 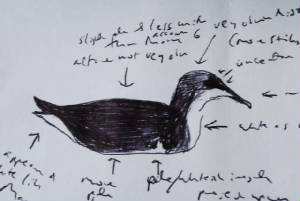 The sketch below (by PMW) is based on earlier notes and rougher sketches and attempts to convey the appearance of this bird in the field, especially the head/neck pattern, in the right-profile views mainly involved. Bird was west-facing, towards low but cloud-obscured sun. The sketch perhaps slightly exaggerates the contrast between grey nape etc and darker 'mask' and upperwings etc (but perhaps not) - the head/neck pattern was quite striking (and the greyness also apparent from the rear). The extent of the 'mask' to the rear / behind eye may be under-represented here. Structural details and details of undeparts (lower neck/breast to vent/undertail) are approximate! Details of forehead / forecrown were not clear in the field. Bourne, W.R.P., Mackrill, E.J., Paterson, A.M. & Yésou, P. 1988. The Yelkouan Shearwater Puffinus (puffinus?) yelkouan. British Birds 81(7): 306-320. Cade, M. 1983. The possibility of east Mediterranean Manx Shearwaters occurring in British waters. British Birds 76(9): 413. Curtis, W.F., Lassey, P.A. & Wallace, D.I.M. 1985. Identifying the smaller shearwates. British Birds 78(3): 123-138. Darlaston, M & Langman, M. 2008. Shear brilliance [Yelkouan Shearwater Puffinus yelkouan, Berry Head, Devon, 29 July 2008]. Birdwatch 195. Garner, M. 2008. Yelkouan Shearwater. Pp 94-99 in: Garner, M. et al. Frontiers in birding. Birdguides, Sheffield. Gutiérrez, R. 2004. Identification of Yelkouan, Balearic and Manx Shearwaters. Birding World 17(3): 111-122. Reese, G.H. ; McCartney, P.; Dubois, P.; Yésou, P. 1986. Mediterranean races of Manx Shearwater in British waters. British Birds 79(7): 351-354. Robb, M., Mullarney, K. & the Sound Approach. 2008. Petrels night and day. A Sound Approach guide. Sangster, G., Collinson, J.M., Helbig, A.J., Knox, A.G. & Parkin, D.T. 2002. The specific status of Balearic and Yelkouan Shearwaters. A report from the British Ornithologists' Union Taxonomic Sub-committee. British Birds 95(12): 636-639. Wink, Michael; Heidrich, Petra & Ristow, D. (1993): Genetic evidence for speciation of the Manx shearwater (Puffinus puffinus) and the Mediterranean Shearwater (P. yelkouan). Die Vogelwelt 114(6): 226-232. Yésou, P., Paterson, A.M., Mackrill, E.J. & Bourne, W.R.P. 1990. Plumage variation and identification of the "Yelkouan Shearwater". British Birds 83(8): 299-319.